Of all the smartphones on the planet, Sony’s have remained largely unchanged for years now. However, the Japanese OEM is finally giving in to the current trend, where it’s reportedly lining up a new flagship phone with a “bezel-less” display, much like what we see on many other high-end phones. Despite the long wait that Sony fans have been subjected to, it’s always better late than never. In fact, Sony has the chance to learn a few thngs from the current market of 18:9 phones and in the process perfect its first bezel-less smartphone into something extremely unique and competitive. If we are right, the said Sony Xperia phone will ship with model number H8541 – and it’s not the first time this number is showing up online. 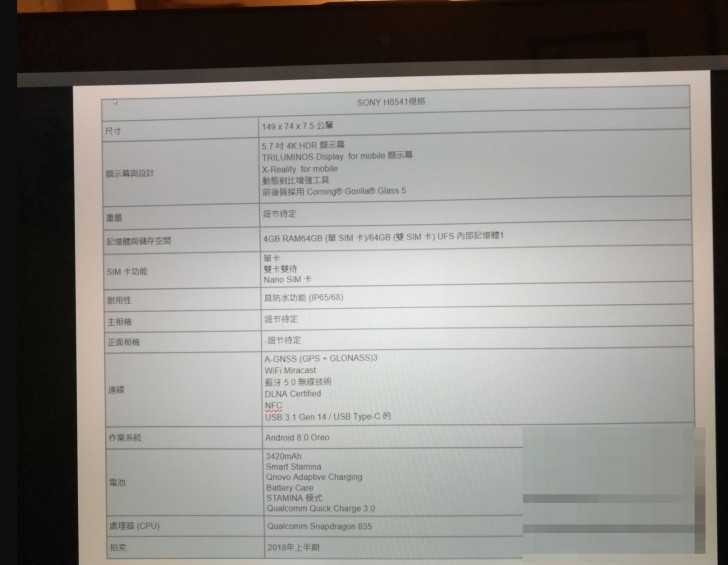 In a leaked spec sheet, the alleged Sony Xperia phone will ship with a 5.7-inch display screen with a 4K resolution, HDR and Gorilla Glass 5 on top. Keeping the phone alive will be a decent 3420mAh battery unit, which is a good pick for such a phone. Even though these are great specs to have on any phone, even in 2018 and probably beyond, Sony is still lacking on a way or the other. By opting for the trending bezel-less display screen, Sony has made massive steps ahead when compared to its previous handsets. On the contrary, the fact that the said Sony Xperia phone will be powered by a Qualcomm Snapdragon 835 processor is disturbing. For any flagship that comes out this 2018, which is when the Sony H8541 is expected to be unveiled, more specifically during the MWC 2018 show, going for a 2017 processor would be a huge mistake. Sony did it with the Xperia XZs and it didn’t turn out so well. HTC and LG did it this year too with the U Ultra and G6 respectively. Well, the two phones are among the cheapest flagship phones on the market right now and compared to their launch prices, they have seen abnormal discounts during their short period of existence. Although the Snapdragon 835 has been quite successful, it’s already an old processor that is set to be replaced this coming week with a new Snapdragon 845, which should be ready for any phone that comes out as early as February 2018. Other than the aging Snapdragon 845, the rest of the Sony H8541 specs are still reasonable for any smartphone user. These include 4GB RAM, 64GB storage, IP68, Android Oreo, Bluetooth 5.0, NFC, and USB Type-C. The phone is expected to measure just 149mm tall, which is just 1mm taller than the 5.8-inch Samsung Galaxy S8. As for now, details of the cameras are still unknown.